I have found that there is a significant lack of reliable information and statistics on the internet pertaining specifically to the Greater Greenville, SC real estate market. As I hope the information below will show, the Greenville, SC real estate market is not only showing continuing signs of stability, but also showing very positive signs in all aspects of our real estate market. I feel that this is due to reasonable home prices, low real estate property taxes, a low overall cost-of-living, a continued influx of new companies, and Greenville just being a great place to live! Aside from job transfer, I would easily say that cost-of-living is the number one reason I hear from people looking to move to the Greater Greenville area. The median sale price of an existing single-family home in Greater Greenville was 22% lower than the median sales price in the United States for April 2012. The US median sale price was $191,600, while the Greenville median was $149,500. As of right now (1/17/2013), the average price for regular unleaded gasoline in the US is $3.254/gallon, while the average in South Carolina is currently $3.169/gallon, a difference of about 3%. Currently, gas prices in Greenville, SC range from $3.02 to $3.09 per gallon for regular unleaded. This may seem irrelevant, but that simple cost-of-living difference means a savings of approximately $196 per year to the average driver, or approximately $33 per month for a two car household. South Carolina is consistently ranked at one of the top 10 states for lowest gasoline prices, while Greenville is consistently ranked in the top 10 U.S. cities for lowest gasoline prices. The cost of living data below represents the data for each city, within the city limits. This is a difficult comparison for Greenville, given the fact that Greenville, SC doesn't annex everything they can get their hands on. Therefore, the actual area of the city is smaller, and the population is smaller as well. However, the breakdown of the data is not readily available for metropolitan statistical areas, other than the data for overall cost-of-living. In the chart below, "Overall MSA" represents the overall cost-of-living for each metropolitan statistical area (since including suburbs is important), while the other rows are a representation of each city. I have also decided to add a few "lifestyle" rows into the comparison chart, since they may be important in your decision making process. There is far more data than this, so feel free to call or e-mail me with any questions, or if you would like the data for your current city in comparison to Greenville. An example of how to read the chart: "Cost-of-living in Asheville, NC is 13.19% higher than Greenville, SC" and "New York City has 7 fewer predominantly sunny days than Greenville, SC". Might not seem like a lot, but I will gladly take an extra full week of sunny days! I chose the following cities for comparison, since they represent the areas with the most visits to my website over the past 30 days. I receive this question via e-mail all the time, so I decided to simply post the most recent data below. The question is, "how many properties are listed in 'X' price range?" I believe that this is an important question to answer, since it shows the value of Greenville SC Real Estate, compared to parts of the country where real estate is much more expensive. As you will see, the vast majority (75%) of all single-family homes currently available in the Greater Greenville area, are priced below $300,000. This is the same percentage as in 2007, when I first started tracking listing distribution by price range. I have taken a significant amount of time compiling sales data from the past 8 years. I have created the charts below by taking data from the Greater Greenville South Carolina MLS. This data represents the single-family homes and condos/town homes sold from 1/1/03 through 12/31/2012. I will continue to update this at the end of each quarter, so please feel free to bookmark this page, and check back often. The first chart depicts the number of single-family homes, condos and townhomes sold by calendar quarter. I have separated new construction and resale homes. This is an area of the Greenville SC real estate market which had seen a decline, but this decline is correcting, with year-over-year improvements. Buyers in many markets are hesitant or on the fence about purchasing a home due to constant negative media headlines about the real estate market, and some people in other markets are simply unable to sell their current home and relocate. The elimination of the subprime lending market also took certain "under-qualified" buyers from the market. Real estate markets are local, and it is important to consider the fact that prices in the Greater Greenville area are still stable (see next chart), therefore the amount a purchaser can afford now will change for the worse in the months and years to come. Interests rates are also fluctuating, and the likelyhood of a higher interest rate when the purchaser is ready to buy, could have a drastic effect on how much home, or the type of home or neighborhood, they are able to afford when they get off the fence. Interest rates are currently at record lows, and despite what you may hear in the media, there are many lenders in the Upstate with lending options that do not require perfect credit or a significant down payment. In fact, there are still loan programs available in the Upstate, which only require 3.5% down, and a minimum credit score of 620. There are even parts of the Greater Greenville, SC area which qualify for 100% financing through USDA Rural Housing, including areas near Woodruff and Fairview Roads in Simpsonville, and parts of Taylors. Overall, the number of resale homes sold in the 4th quarter of 2012 increased by 28.83% compared to the 4th quarter of 2011. Many people are attributing the perceived increase in home sale activity (decreased time on market, multiple offers, etc) on a decrease in listing inventory. However, 2012 was busiest year for existing (resale) home sales since 2007! The next chart depicts the average sales price of single-family homes, condos, and townhomes in Greater Greenville, and resale homes have again been separated from new construction. You will notice that resale home prices (blue) have been steadily increasing over the past 10 years for resale homes. Overall, the sales price of an exisiting single-family home, condo or townhome has increased by an average of 1.69% year-over-year since 2003, and even by an average of .7% per year for the past 5 years, when most areas have been declining. This stable appreciation is another reason why the Greenville market continues to be a sound investment while other markets are just now starting to makeup what they've lost over the past 4-6 years. The most recent data shows that the average sale price for existing homes sold in Greater Greenville during 4th quarter of 2012 was highest on record for the Oct-Dec timeframe, beating the previous best (4Q07) by 4.8%! The average price of existing single-family homes, condos, and townhomes increased by 12.1% in 4th quarter 2012 compared to 4th quarter 2011. Average prices of new construction also increased, by 8.09% in 4th quarter of 2012, compared to 4th quarter of 2012. Builders are now starting to get back to doing regular price increases. This chart depicts the time it takes to sell an existing single-family home in the Greater Greenville SC real estate market. This duration is based on the time from the day the listing is first entered into the Greenville SC MLS, until the day a contract for sale is negotiated and signed. I have decided to remove the data from before 2009, due to the fact that the MLS changed the method in which they calculate this figure. We now use "cumulative days on market", which takes into account any time the home was previously listed under a different MLS number, without selling. Fourth quarter of 2012 saw a decrease in the average by nearly 21 days (down 12.6%) to 143.1 days compared to 4th quarter 2011. Greater Greenville is still much lower than the national average, but it would still be nice to see this number return to at or below 120 days. 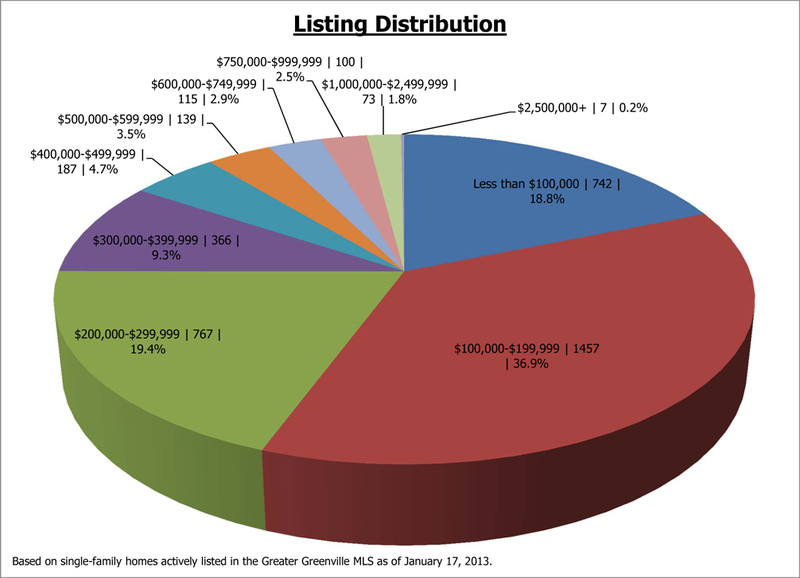 I hope this information helps in your decision to either buy or sell a home in the Greenville SC area. It is my firm belief that a healthy market is one where prices continue to rise, and the time it takes to sell a home continues to fall. The Greenville area continues to be ranked very highly in various reports, including Best Places to Live, Best Places to Retire, Best Places for Young Professionals, Tastiest Towns in the South, and more. If you have any questions, please feel free to contact me. Remember, I will be updating this page about 2 weeks after the end of each quarter, so keep checking back for updated statistics.